The mornings are getting colder. We begin to shy away from cold cereals and shift to a warm bowl of Quaker oats or to a generous platter of thick pancakes with brown sausage links, crackling bacon bits and Maple syrup. Or else we look forward to honest-to-goodness homemade breakfast buns. You may have heard of the saying that a baby is God’s way of telling us that life must go on. Well, warm buns are heaven’s way of telling us that we ought to get our buns off our bed and head straight to the kitchen. Buns also reinforce the idea that breakfast is a sacred ritual that should never be skipped. I do feel sorry for people who deliberately stay away from breads – any kind of bread – simply because they’re fattening. 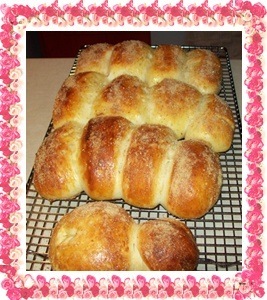 How can anyone not like bread, especially the sweet ones? I can imagine getting tired of sourdoughs and baguettes after awhile but buns that are mildly sweet and soft – they’re to die for, don’t you agree? These basic breakfast buns go with anything – scrambled eggs, egg salad, tuna, ham – or more simple fillings like jam and peanut butter. Why, they’d probably taste just as heavenly with mashed sweet beans or custard! 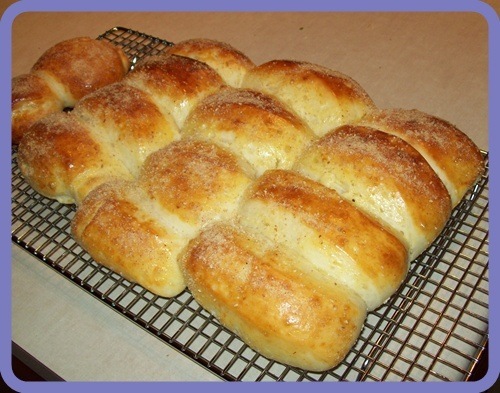 People back home had their own version of buns which they called pan de sal. Try googling the recipe and you’ll get a dozen different ways of making them – some are with the basic ingredients of yeast, water, sugar and salt; some are made with eggs; still others are made with evaporated milk or regular milk. Mine is a mish-mash of these ingredients and I’d be happy to send you the recipe. E-mail me at ques2008@gmail.com. If you like these, you’ll also like Spanish bread (https://sotsil.wordpress.com/2009/08/18/spanish-bread-subtle-sweetness/). The country was recently ravaged by a couple of typhoons. I saw some footage on TV about rescue and relief efforts – boxes and boxes of food and clothing. I hope those boxes contained a lot of rice and flour because Pinoys, as you might have guessed, love their rice and their bread! During emergencies, they will survive and with generous amounts of good humor – as long as they have their kanin (rice) and tinapay (bread).